Taipei, Nov. 25 (CNA) Ting Shou-chung (丁守中), the Kuomintang's (KMT) candidate in the Taipei mayor election, has sought a vote recount, criticizing the election and vote counting process as fraught with major flaws. Ting filed a petition with the Taipei District Court around 3:15 a.m. Sunday, demanding the court seal up the ballot boxes and a voter roster in the Taipei mayoral election held a day earlier in preparation for a vote recount. After Ting's petition, the district court cited the Civil Servants Election and Recall Act as saying in a ruling issued at around 6 a.m. that the KMT candidate should pay a certain amount of deposits within 24 hours or his petition will be turned down. In this case, as a total of 1,427,643 ballots were cast in the mayoral election in Taipei, Ting will have to pay NT$4,282,929 (US$138,606) as deposits for the vote account, as each vote costs NT$3 in the recount. Before the petition, Ting had vowed to file a lawsuit to invalidate the mayoral election result just 12 minutes before the Central Election Commission (CEC) released the official result of the election at 2:36 a.m. Sunday. The result showed that incumbent Taipei Mayor Ko Wen-je (柯文哲), an independent candidate, won re-election by a razor-thin margin of 0.23 percent, or 3,254 votes in the Saturday local "nine-in-one" government elections. Ko received 580,820 votes, or 41.05 percent of the votes cast, against Ting's 577,566 votes (40.82 percent). Yao Wen-chih (姚文智) of the Democratic Progressive Party (DPP) received 244,641 votes, or 17.29 percent. In response to Ting, Ko said he was not aware of any irregularity in the election process but emphasized that he respected Ting's right to take legal action. Due to the inclusion of 10 referendums in Saturday's elections, long lines were observed in many polling stations across the country, with many voters saying they waited for more than two hours to cast their ballots. In Taipei, according to Ting, although vote counting and reporting began shortly after 4 p.m., some polling stations didn't close until 7:46 p.m., because of the long lines. That allowed voters to check up-to-date election results online while waiting to cast ballots. "During the three hours and 46 minutes, voters saw the results come in as they cast their ballots," Ting said. "It was a deliberate attempt to manipulate strategic voting." The "strategic voting" Ting referred to was the possibility that pan-green voters who initially intended to vote for Yao might have changed their minds and voted for Ko to keep Ting from winning after seeing Yao trailing far behind. In Saturday's elections, the DPP suffered a crushing defeat by taking only six seats in the 22 city mayor and county magistrate elections, while the KMT grabbed 15. That meant the DPP has lost more than half of its 13 posts, while the KMT gained more than double the 6 seats it held. 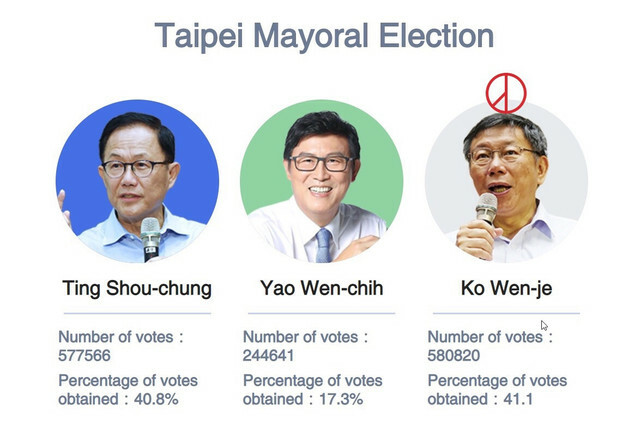 The most hotly contested posts were the mayoral elections in the six special municipalities of Taipei, New Taipei, Taoyuan, Taichung, Tainan, and Kaohsiung. 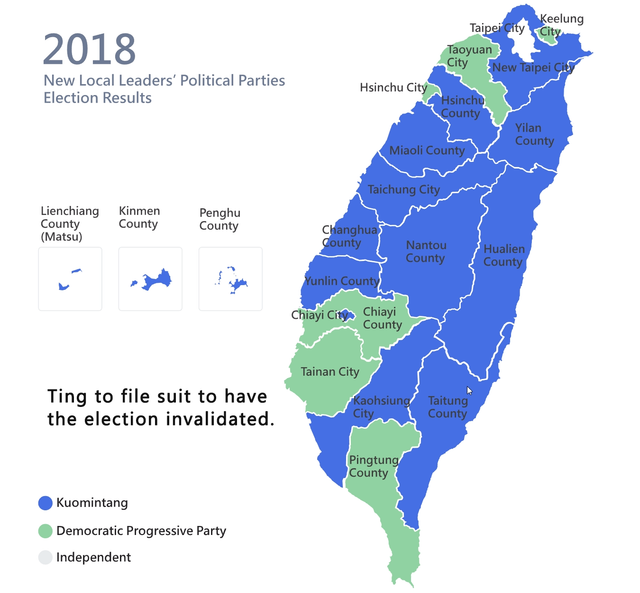 The DPP lost to the KMT in Taiwan's three major cities New Taipei, Taichung and Kaohsiung and kept the seats only in Taoyuan and Tainan cities. President Tsai Ing-wen (蔡英文) announced her resignation as chairwoman of the DPP late Saturday to take responsibility for the ruling party's crushing defeat in the local government elections. Premier Lai Ching-te also offered to resign but the president has not accepted his decision.